This simple wooden fish is splashed in vivid colors on one side, but when flipped over it reveals in stark contrast skeletal remains on a black background. Viewed individually each is unique and beautiful. When they are exhibited together by the thousand(s) they are a monumental temporary public art installation that connects participants and passers-by. The Solidarity Fish, painted by kids and ordinary people are an icon of the clean water movement in Florida. They have been from the Everglades to Washington, D.C., from the steps of the Capitol Building in Tallahassee to the cover of most major Florida newspapers and in the New York Times. Raising awareness and inspiring stewardship with a striking participatory art project created by ordinary people doing extraordinary things. Working together to change the status quo. 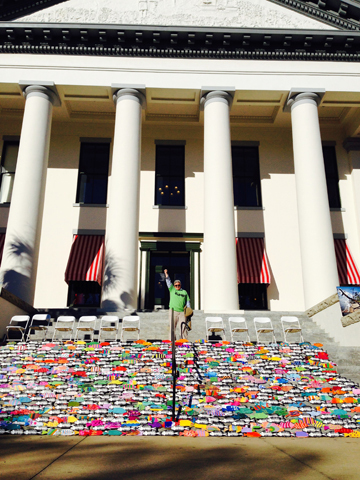 Over 2,000 Solidarity Fish made of wood and painted with passion by children and adults from the Indian River Lagoon graced the steps of the Old Capitol Building in Tallahassee, Florida, on February 18, 2015. This is a photo of Cris Costello, from the Sierra Club, who organized this rally for clean water. Hundreds of people came from across the state to impress upon our legislators how dedicated we are to buying the land, cleaning the water, and sending it south to save the Everglades.